Believe it or not, the 10th-generation Mitsubishi Lancer Evolution has one of the most complicated AWD systems in history. 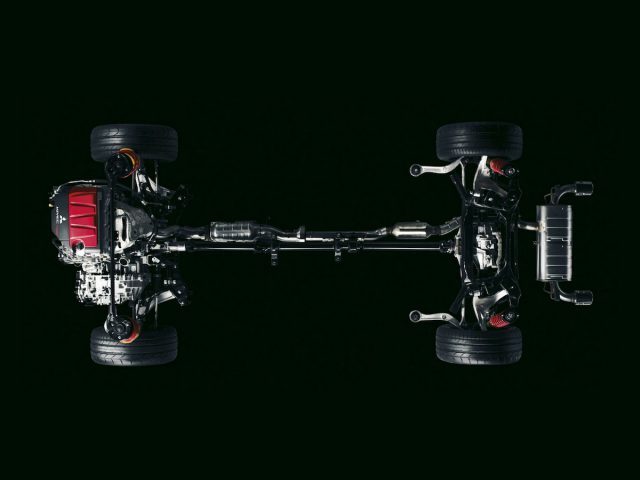 Specifically, it is the most advanced AWD system implemented on the transverse FWD platform. Major reason is: it has a “real” (gear-type) front, center and rear differentials, and all differentials have some sort of mechanical limited-slip or active torque vectoring device built-in. In the following I will provide a detailed review of this system. 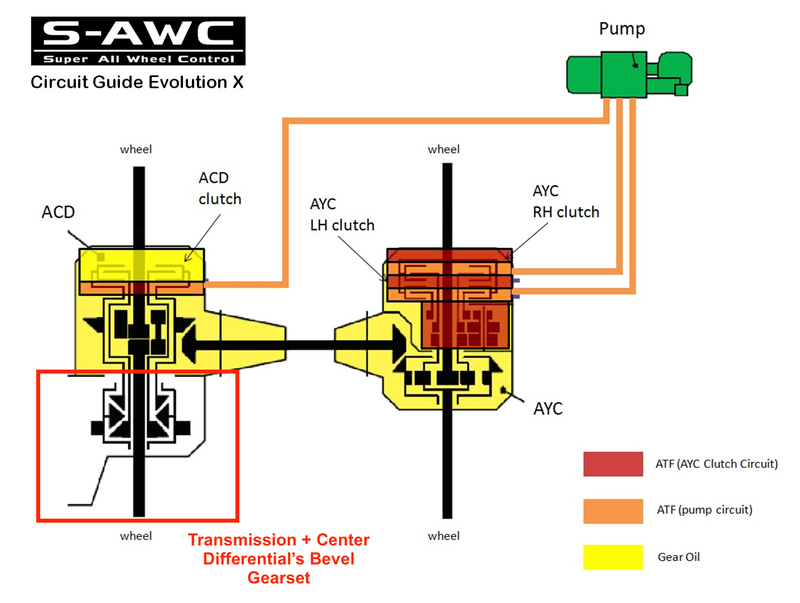 Mitsubishi names its AWD system on the Evolution X “S-AWC.” Below is the illustration of its major components. Rear wheel: helical-gear type differential, plus a planetary gearset system to implement left-right torque vectoring on the rear wheels (Mitsubishi officially names this Active Yaw Control “AYC”). Such design is common in this sector, other competitors such as the Ford RS and Civic Si also use the same approach. 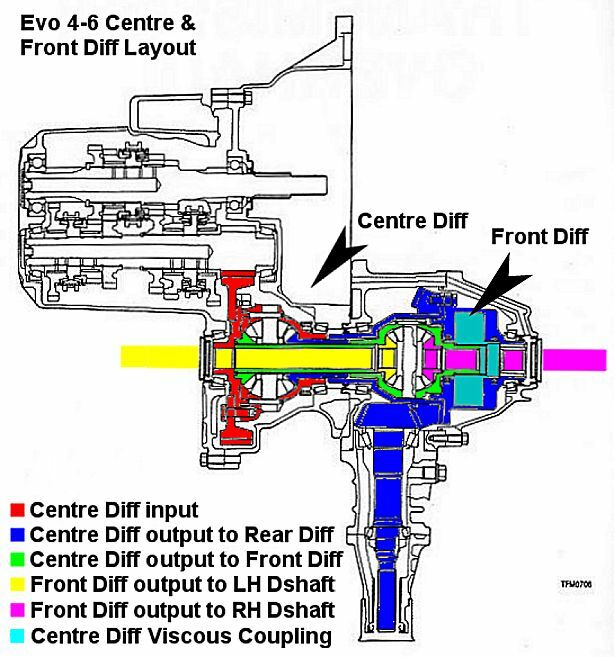 Please note that the multi-plate clutch on the right hand side is for the center differential only, it is not relevant to the front differential. The S-AWC’s center differential is integrated into the transmission casing. S-AWC center and front differentials are housed in the same casing. To understand how to utilize the clutch pack to implement front/rear torque lock %, please note that the static friction between the input/output clutch plates determine how much force (or power) can be transferred through. For a given static friction value, if the transmitted power tries to exceed that limit, the two clutch plates will slip, therefore no more power can go through. For example if we require the lock % to be 30% front and 70% rear, and at a certain moment the engine is outputting 100 hp, the static friction in the clutch pack should be accurately adjusted to transfer 30 hp to the front, no more and no less. Since the coefficient of static friction of the clutch plate material is pre-determined and fixed, the ECU can electronically control the pressing force (through the hydraulic pump) to modulate the static friction between the input and output plate. The S-AWC’s rear differential distinguishes the Lancer Evolution from its competitors – because it is an active torque vectoring differential. It is called “S-AYC” in Mitsubishi’s official language. 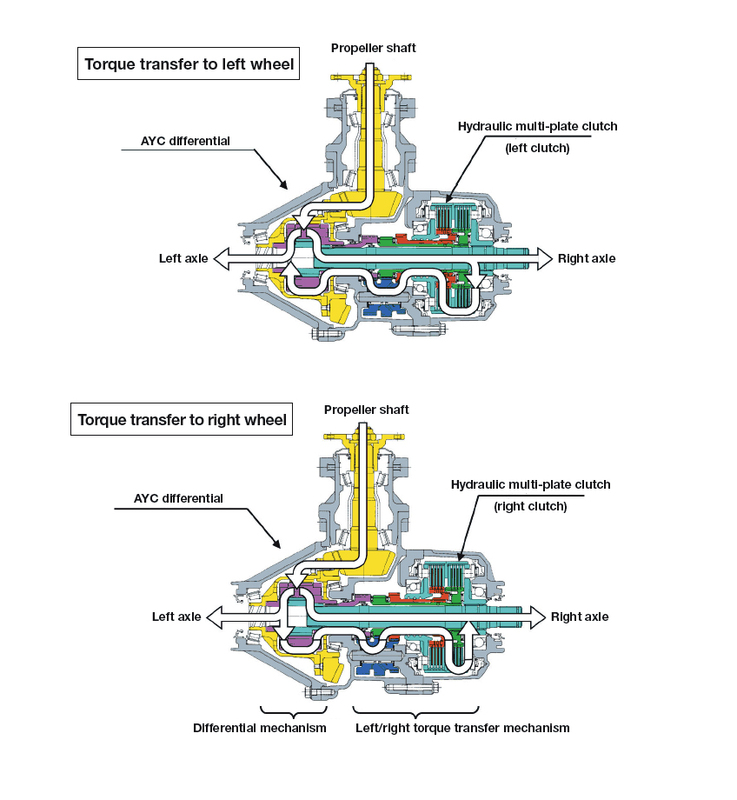 In fact, Mitsubishi is the first auto maker in human history to offer torque vectoring differential in a production car (4th-gen Evolution, 1996). 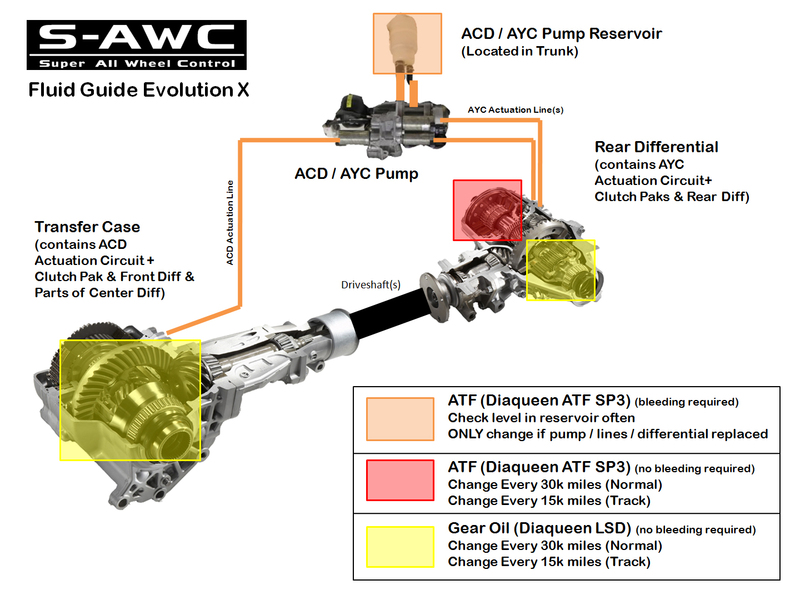 Below is the cutaway illustration of the S-AYC application on Evolution X’s rear wheels. 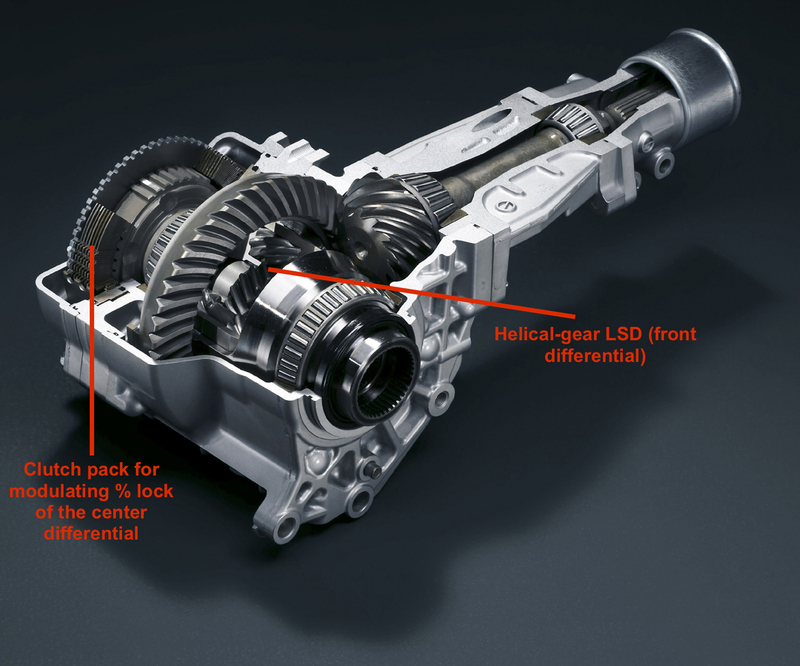 Please pay attention: the S-AYC is fundamentally different from the limited-slip differential. For a limited-slip differential, its purpose is to transmit more torque to the wheel which rotates slower (because a slipping wheel usually rotates faster). However, during cornering the outside wheel (which rotates faster), is the one that needs more torque instead. Therefore, a “normal” limited-slip differential will more or less do more harm than good to the vehicle’s cornering performance. Active torque vectoring is another story. 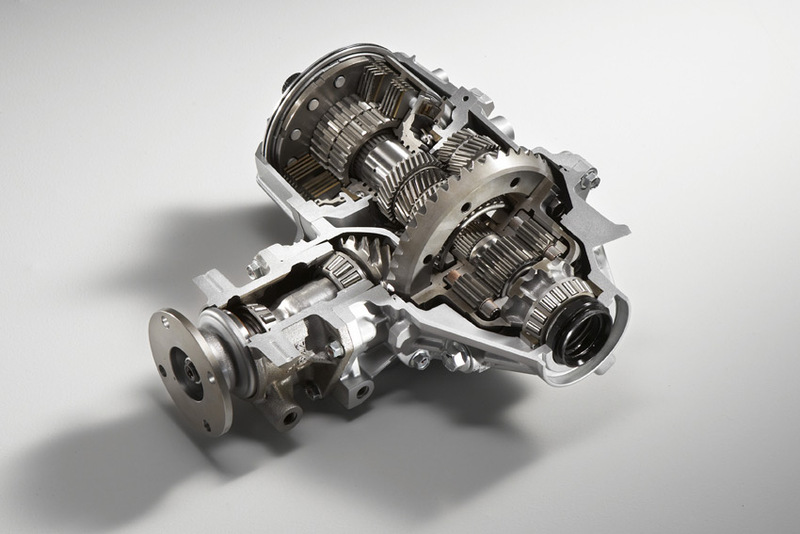 Mitsubishi’s S-AYC is a clutch-based mechanism. The rear left/right wheels connect to a set of clutch plates respectively, we call it the “output plate” in this article. The drive shaft (extended from the center differential) is connected to another set of clutch plates, the “input plate”. When making a turn, the outside wheel rotates faster while requiring more torque to help finish the turn quicker and make the car’s handling more nimble. However, the drive shaft (also the input plate) rotates slower simultaneously. We all know: it is impossible for a slower rotating clutch plate to transmit power to a faster rotating plate. Therefore, the S-AYC needs to come up with a solution to allow the slower-rotating input plate to drive/transmit power to the faster-rotating output plate. This means when a wheel is rotating faster, the clutch plate it connects to should be rotating slower than the input plate; and when the wheel is rotating slower, its corresponding output plate should be rotating FASTER than the input plate. This prompts us to something that has two different gear ratios, and this is how the planetary gear set comes into play for the S-AYC differential. As shown above, the S-AYC consists of two clutch sets and a planetary gear set. Clutch set A handles the “torque to left” case, and clutch set B handles the “torque to right” case. Each clutch connects to a specific gear ratio setting of the planetary gear set. This allows the S-AYC to distribute more torque to either left or right wheels under any circumstance (hence the name “active”), which is the major difference between active torque vectoring and LSD. Currently only the Subaru WRX STI’s AWD system can be comparable to the Evolution. The STI uses a rear-biased planetary gear set center differential + two layers of limited-slip mechanisms (mechanical + electronically controlled), and its effectiveness rivals the Evo’s bevel-type center differential. However, the STI uses a Torsen rear differential, which implements something similar to torque vectoring through braking. Such design is inferior to the Evolution’s S-AYC rear differential, which has a higher degree of freedom in actively modulating left-right torque distribution. 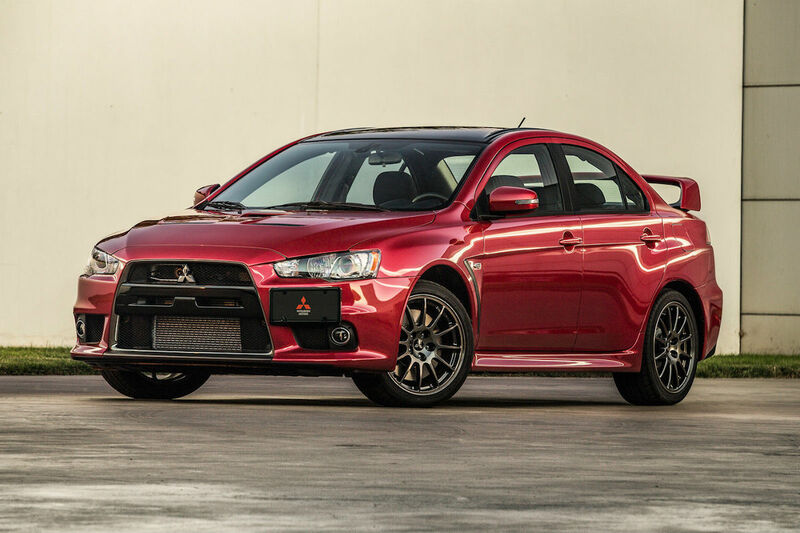 It is truly unfortunate that Mitsubishi has discontinued the Lancer Evolution after the 2015 model year. If you want to own a masterpiece that represents the apex of the production car-based AWD system, you should get your hands on one while you still can, as it is unlikely that there will be something as good as the S-AWC in the near future.